Krskopolje Pigs, also known as Blackbelted pigs, are from the Carniola and Styria regions of Slovenia. 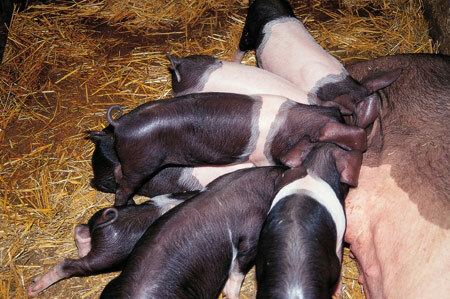 The back parts of Krskopolje Pigs bodies are usually black, with a wide white stripe or belt around the body. Their head is medium-length and flat, with big, hanging ears. They are characterized by an average fertility, a good appetite, growth ability and large adult weight (adult animals weighed 250-300 kg).